Charleston, SC- WanaRyd Motorcycle is pleased to announce the introduction of The Rollin, a unique 5-spoke directional 3D wheel that’s part of their Stark-Line Series…a new premium line of 3D forged one-piece billet wheels. The Stark-Line Series features a revolutionary new finish that is totally unique and proprietary to WanaRyd Motorcycle. The Stark-Line Series Rollin wheel is a sensational 3D cut 5-spoke wheel…Designed for those that want a simple yet exciting look. This wheel is such a hit that WanaRyd has had several companies in the industry attempt to copy it…but no one can beat the original. This is WanaRyd’s best selling wheel and it looks outstanding with any style Harley-Davidson, especially Street Glides, Road Glides, Electra Glides, Softails and Fat Boys as well. The Stark-Line Series offers 6 different wheel designs as well as matching rotors in 3 different styles and sizes and matching pulleys (including Cush drives which most other wheel companies don’t offer) and are available for all 1984-Present Harley-Davidson models, many Victory models as well as other metric cruisers. 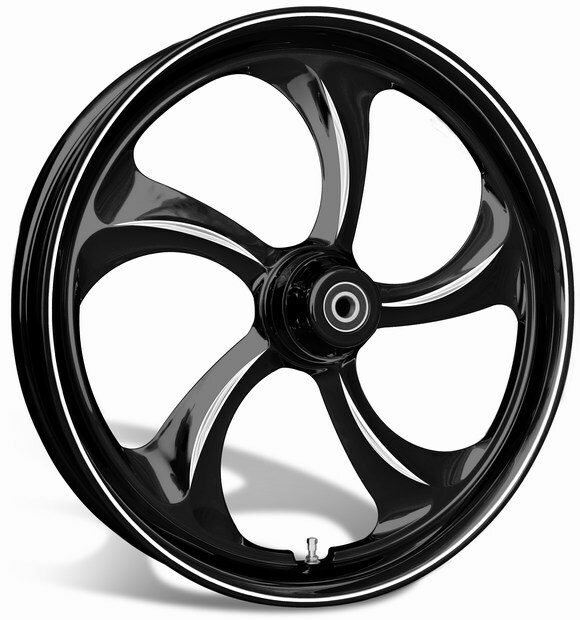 All Stark-Line Series wheel designs are also available in chrome or black powdercoat. For those interested in obtaining more information on WanaRyd Motorcycle, you can reach them at 888-926-2793, email them at sales@wanaryd.com or check them out online at www.WanaRyd.com.